A World War Two observation post at Beeston Regis Hill is visible on aerial photographs taken during the 1940s. In 1941 photographs it appears as an octagonal embankment or walled structure surrounded by a ditch. By 1946 the structure was built of concrete. A trench or channel links the emplacement to a large system of slit trenches (NHER 38279) to the south. All that survives above ground is the concrete base of the structure. April 1985. Summit of hill. Polygonal concrete base of demolished pillbox. Other foundations to west may or may not be connected. E. Rose (NAU), 15 August 1994. Rare 1940/41 structure, thought to be observation point. Channel running across floor, possibly for range finder, searchlight or other equipment needing power. D. Walker (NLA), July 1996. The site of a World War Two observation post on Beeston Regis Hill, Sheringham, approximately located at TG 1678 4329. This site forms part of the World War Two coastal defences on the hill (NHER 38279) which are visible on aerial photographs from the 1940s (S2 to S3). Please refer to record NHER 38279 for further details. On aerial photographs from 1941 an octagonal embankment or walled structure is visible, measuring approximately 5m across (S2). This is surrounded by an outer ditch. 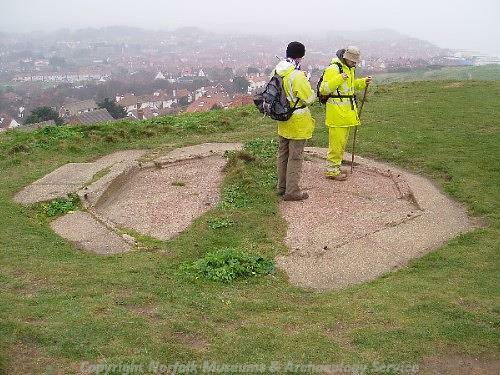 This octagonal emplacement has an opening to the south, through which a trench or channel runs down to the south, linking to a larger slit trench system (NHER 38279). On the RAF aerial photographs from 1946 (S3) at approximately the same location is a concrete octagonal structure, which has the appearance of a pillbox, or the aforementioned observation post. It seems likely that this is the same structure at a later stage of construction or use. The associated trenches are no longer clearly visible. S. Massey (NMP), 29 March 2004. See 2004 Norfolk Rapid Coastal Survey entries NHER 41557, NHER 41558 and NHER 41559. December 2004. Land-based fieldwork phase of the Norfolk Rapid Coastal Survey. NHER 41017, area A16, context 21. Concrete and brick base for a Second World War pillbox, located on the top of Beeston Bump at TG 16777 43306. See (S4) for further details. A. Cattermole (NLA), 6 December 2007. <S2> Vertical Aerial Photograph: RAF. 1941. RAF S/378 66-7 07-AUG-1941 (NMR). <S3> Vertical Aerial Photograph: RAF. 1946. RAF 106G/UK/1571 3179-80 07-JUN-1946 (Norfolk SMR TG 1542B, TG 1642A). <S4> Unpublished document: Robertson, D., Crawley, P., Barker, A., and Whitmore, S.. 2005. NAU Report No. 1045. Norfolk Rapid Coastal Zone Archaeological Survey. Assessment Report and Updated Project Design.. p 128.